Needless to say, vampires have an infinite history in folklore and the popular imagination. Often metaphors for infection, addiction, opulence, and burgeoning anxieties about the presence of the unfamiliar like many mythical monsters, vampires add an additional lure that embodies something to be desired and/or envied for as many reasons as there are films and books on them. Black female vampires have been depicted in a variety of ways that map the history of Black women's negotiation with intersectionality. I decided to look at one well-known character from each decade beginning with the 1970s, deciding that each character forms a narrative about how we possibly see Black female identity, even within ourselves. One of the first, sister vamps seen on the big screen, the portrayal of Tina as a vampire plays a very marginal role in relation to her male half, Mamuwalde (Blacula). When Mamuwalde loses his life and livelihood to Dracula following his refusal to offer slave traders any of his people in 1780, he is cursed with vampirism and his wife Luva is taken into captivity. When Blacula is revived from his coffin prison in 1970s Los Angeles, he happens upon Luva's double Tina and seeks to have her as his new bride. Tina becomes entangled in the pursuit of Blacula who is a suspect in some mysterious disappearances and he feels there is no other choice but to turn her when she succumbs to a bullet meant for him. Not long to be developed as a full character, she's not much above an unseemly creature who is soon dispatched. Both Luva and Tina are more damsel to the romantic subplot than an active agent that moved the story along. The running theme in Black horror films in the 70's was a 'stand by your man' attitude many female characters embodied in a variety of complex ways. Unfortunately, Luva/Tina fades into obscurity in comparison to Blacula and other female leads. It can be said, and has been, that there's power in silence. That's probably the simplest way to describe head V in charge, Katrina portrayed by Grace Jones in 1986's Vamp. 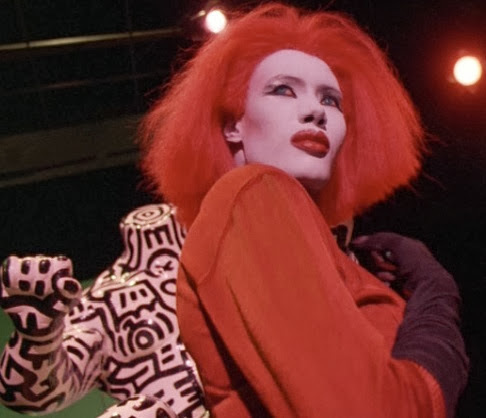 Ruthless, seductive, with an avant-garde flare that reflected 80's new wave-esque subculture, Jones' role seemed regulated to an almost exclusive visual fare. A role that consists of virtually no lines for a significant character is... intriguing. What is important to read in Katrina is the way she uses expressions suspended from words that affirm her authority. She commands respect with an artful striptease in a skin bar doubling as a vampire nest cover. Keep in mind, Katrina is a branch on the vampire trope tree; living for the purpose of feeding and not much else unfortunately. Except for ruling by stark intimidation. 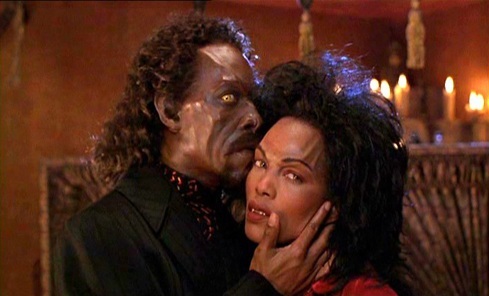 Vampire In Brooklyn often does not get a fair shake. I've read up on the work of Wes Craven and am very aware that Eddie Murphy's superlative reputation (at the time) as a solid comedic genius hurt his ability to tell the kind of vampire story he initially wanted. Noted, the main female protagonist Rita played by Angela Bassett opened the floor for questions of female agency, religion, lineage, and the ever intriguing themes of isolation and transformation in Black bodies in the popular imagination. There's a tug-o-war as to whether the main story was Rita's or Maximillion's played by Murphy. As the the anchor between good and evil, Rita struggled with an arc that was complicated by her established life of feeling like an Other in an otherwise normal society. With Max, she would be free of her turmoil. With Max, she would be an immortalized monster with no remorse. But with Max, she would terrorize the innocent and drown in (Rita's) moral depravity. Rita is perhaps the most layered amongst this group. The downtown jungle of Los Angeles home to the downtrodden, forlorn and desperate makes the perfect roost for this trio of ancient one's. When going out to "feed" becomes too dangerous, they concoct a plan to bring their dinner home with an all night massage parlor that offers to cater to the kinkiest of midnight tastes. But when a young woman, who has been evicted by her husband arrives on their doorstep, they don't realize the danger they are letting into their nest. I cannot comment on its version of Black female vampires, but reviews exist to give you a better idea if it's worth the watch. I would say definitely if you love the iconic concept or studying these creatures. 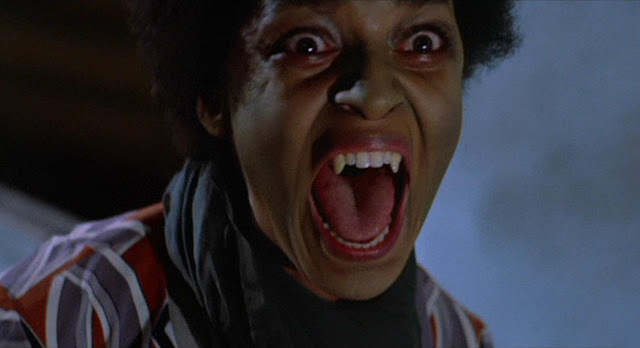 Are there any other notable Black female vampire's in cinema's history?